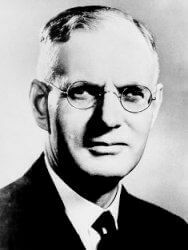 JOHN CURTIN(1885-1945), Prime Minister and journalist, was born on 8 January 1885 at Creswick, Victoria, eldest of four children of Irish-born parents John Curtin (1854?-1919) and his wife Catherine (Kate) Agnes, née Bourke (1859?-1938). John senior worked as a warder at Pentridge Gaol, served as a soldier, was a policeman at Creswick (1881-90), due to ill health the family moved when John was only 5 when his father was employed in hotels, sometimes as manager, in Melbourne and at Dromana, Charlton, Macedon and elsewhere. The family eventually settled, in poverty, at Brunswick.